Marijuana Microbusiness is a type of licensing regulation utilized where the recreational use of marihuana has been legalized. Similar to microbreweries for the production and sale of alcohol, marihuana microbusinesses are independently owned businesses that grow, process and sell their own marihuana. By applying for a micro license, an individual 21 years of age or older may be allowed to grow, process, and sell marihuana to others 21 or older. This comes with certain limitations placed on the quantity the micro licensee may grow and to whom they may sell their product. In the state of Michigan, a proposed initiative called the Michigan Regulation and Taxation of Marihuana Act (MRTMA) would allow an adult, 21 years of age or older, to apply for a license to operate a Michigan marihuana microbusiness. A microbusiness, as defined in MRTMA, allows an individual to operate a marihuana business cultivating not more than 150 plants, processing, and packaging marihuana products made from plants they grew, and selling and transferring marihuana to individuals who are 21 years of age or older, but the licensee may not sell to or purchase from other marihuana establishments. Therefore, a licensee may not conduct business with another marihuana grower, processor, retailer, or any type of marihuana related business. 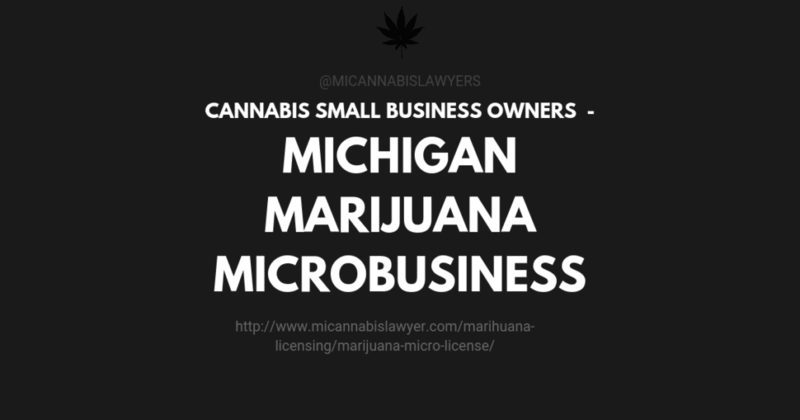 If you have been interested in getting into Michigan Marijuana Microbusiness industry and are excited about a new sector of that industry, contact the lawyers who stay on the cutting edge. Call the Michigan Cannabis Lawyers today at 517-512-8364. Can you license your existing marijuana brand or recipe? Bureau of Marijuana Regulation says yes. What will the costs be for this type license? Would a commercial building be required? Would a storefront be allowed for sales? Can I get some more info on this please? What is the price of the micro business licenses? Thank You. With a micro business license, what is the procedure to be allowed to sell to processors for example, if I don’t necessarily want to sell to end consumer? The law and this article clearly state that you WILL NOT be allowed to sell to processors. Any idea what the price will be? Will there be a huge application fee again? Can the microbusiness be located in a resistance? In other words can I grow 150 plants from my house with a micro liscence? Is there any information about the costs, fees, licenses, etc. to apply for and obtain a microbusiness license? Is there any recent news about Michigan’s marijuana microbusinesses? What is the statutory provision for micro licenses ? Any information would be helpful. I would like to apply as soon as I’m able to.